If it’s good enough for Brangelina it’s good enough for me! In November 2011, four years after adopting their second child Pax Thien, Brad Pitt and Angelina Jolie returned to Vietnam. 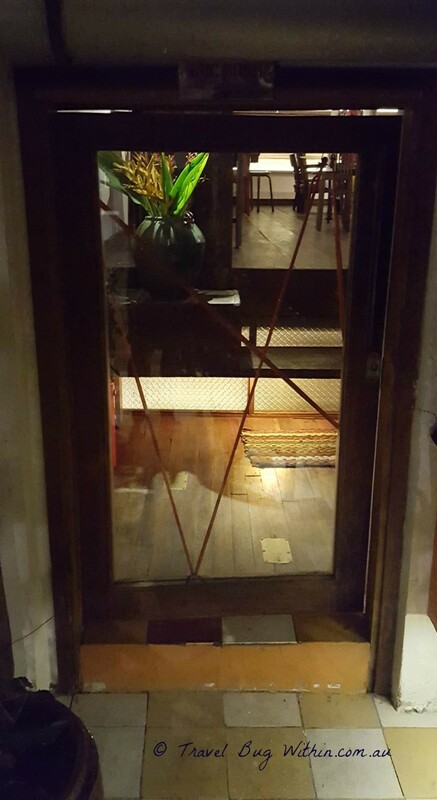 They were spotted eating at Cuc Gach Quan – a restaurant in Saigon. I also recently dined at Cuc Gach Quan but it wasn’t because of the Brangelina connection (which I found out way after my visit.) That’s just a bit of celebrity trivia for you! I was in Saigon having just completed a quick tour of Vietnam with G Adventures. Traveling solo to the Mekong Delta area, I met another Australian traveler who was cycling around the Mekong region. That’s the funny thing about travel – you go so far and meet random people from your home state. 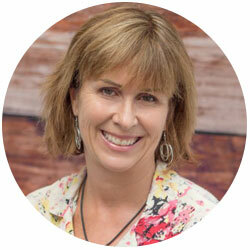 Sally grew up in the small regional Queensland town of Lake Eacham, Yungaburra. For the last four years, Sally’s been living and working in Saigon teaching English. We talked about the challenges when making dining choices in a foreign city, it’s always helpful if a local recommends a place to eat. Sally gave me a few recommendations in Saigon. Cuc Gach Quan was one of them. With so many incredible eating establishments in Saigon (or Ho Chi Minh City) I wouldn’t know where to choose. With G Adventures, we’d dined at various restaurants, but I wanted to make my last night in Vietnam a new experience and a special one. Thanks to Sally, I chose Cuc Gach Quan. I gave the hotel Doorman Cuc Gach Quan’s address. He explained to my taxi driver, making it easy for me. Was I ready to hit the crazy streets of Saigon again? For the entire time I’ve been in Vietnam, any road trip has been an anxious experience. There are no road rules and with the number of people living in Saigon (8.4 million) every road trip has been exhilarating (to say the least.) The taxi trip to District 1 was another of those “best not look out the window” rides. Thankfully it took only 15 minutes to reach Dang Tat Street, where the restaurant, on the ground floor of an old restored French Colonial house was meant to be. It was around 7.30pm and night had fallen, making it difficult to locate the nondescript facade. As the taxi drew into a quiet back street, I wondered if I should ask the driver to wait? But before I could suggest this, my taxi door is wrenched open and I’m greeted with a welcoming smile. It’s the restaurant’s doorman. Despite Cuc Gach Quan’s low key exterior, I am in the right place! Once inside I’m greeted by more smiling faces and lead to the reception desk. The room has a couple of intimate areas for eating with larger spaces for bigger parties. Tonight all rooms are crammed with diners. I’m dining solo and have not made a reservation. Will they be able to accommodate me? “No problem,” says the smiling hostess. “This way,” another face appears beckoning me to follow. I shadow this man to the back of the restaurant into a courtyard framed by a large pond (or water feature? I’m not sure.) I follow stepping cautiously on the coloured mosaic tiles surrounding the pond, not wanting to slip and make a fool of myself by falling into the water! We head up some narrow steep stairs through a very small doorway – so low I had to duck to avoid knocking my head (a remnant of the colonial house?) 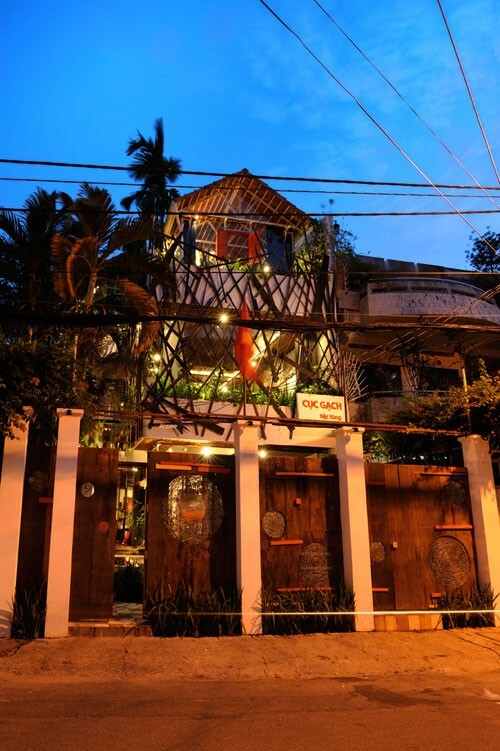 I’m beginning to appreciate the restaurant’s nickname: the architect house. 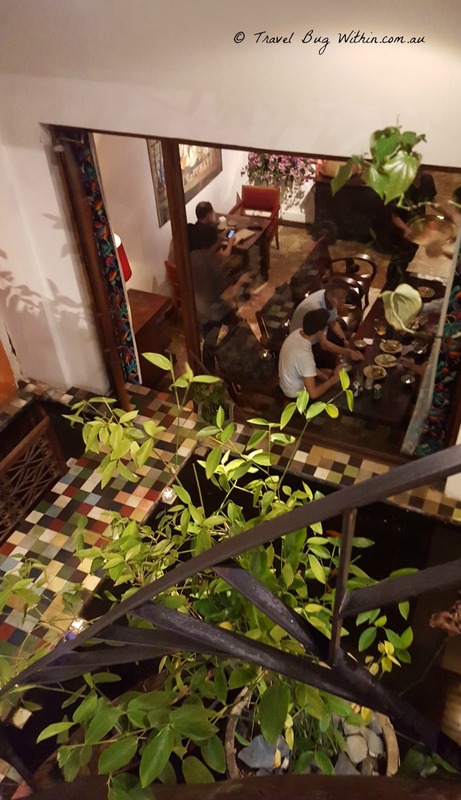 The interior is filled with quirky features, greenery and an eclectic collection of Vietnamese ornaments. 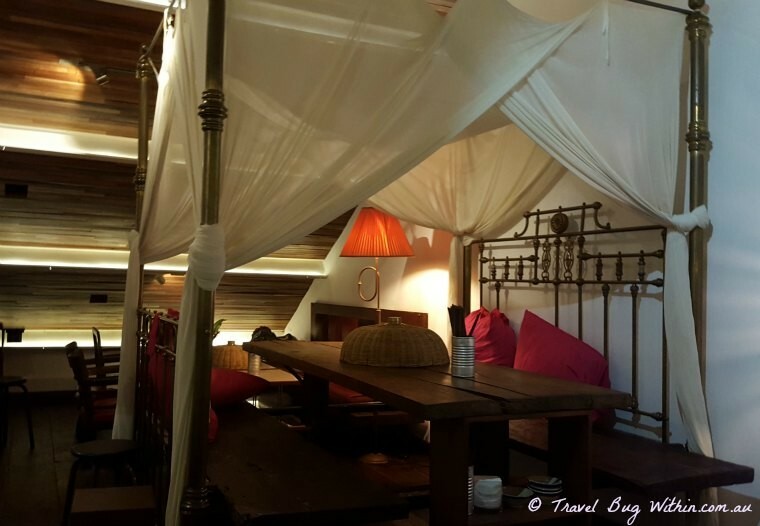 The room I step into replicates an exotic bedroom with a converted four-poster bed covered in gauze. The room is noisy, a table of loud Americans sitting at a large table enjoying themselves. My journey continues as I’m ushered into yet another room to the left via a stooped doorway (Vietnamese colonials obviously short in stature.) Many smaller tables fill the space. My smiling waiter indicates my table in the corner. Finally, this is my resting place – an almost empty room, which was a little disappointing compared to the areas I’ve passed. Two ladies are quietly chatting in the opposite corner. I’m handed the menu, a mini book in English. It’s filled with pages and pages of national dishes and I’m occupied for some time. A short piece on the inside page shares what motivated restaurant owner and architect Tranh Binh and his wife Thai Thu-to to open the restaurant. They want diners to feel as though they are dining at home as if the food had been prepared from their very own Vietnamese kitchen. They promise fresh food – purchased at the morning markets. The focus is on original, pure flavours without MSG and free from preservatives. Their creed is to “eat green and live healthily.” The multiple vegetable choices were a testament to that promise! But non-vegans don’t be concerned, there were many enticing meat and seafood dishes amply satisfy the dining carnivore. I eventually settle on one of my Vietnamese favourites – fried TOFU with dried lemongrass and chilli. 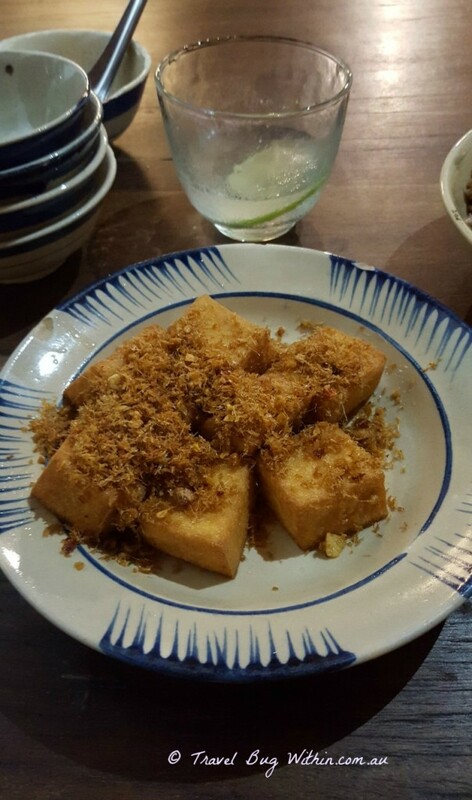 Fried homemade tofu with chili and lemongrass. Such a simple dish and I enjoy every mouthful of this melt in your mouth tofu. I selected a chicken and fried rice dish, which was a generous size (enough for two) and flavoursome. I was keen to try one of their signature dishes, zucchini flowers sauteed with garlic and beef. But sadly my belly had no room – the other dishes were too good – I cleaned the plate! The wine list and cocktail choice was extensive (most cocktails around 95,000 dong or $6.50 AUD.) The dishes ranged in price from 65,000 – 200,000 dong. Although this is reasonably priced to Westerners, I doubt the Vietnamese locals would pay that price. 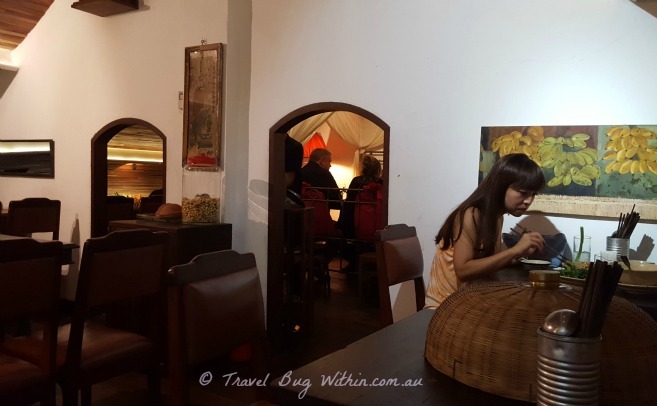 I loved the quirky atmosphere, the impeccable service and the gourmet Vietnamese food. It was the perfect place for my last night in Vietnam. Tel: +84 (08) 38 480 144 Larger parties: make a reservation!